A bite from a parasite-carrying tsetse fly can cause trypanosomiasis in animals and sleeping sickness in humans. The United Nations International Atomic Energy Agency (IAEA) today opened the doors of a new laboratory to help countries use a nuclear technique to keep harmful insects, such as mosquitoes and fruit flies, at bay. The modern Insect Pest Control Laboratory (IPCL), located in Seibersdorf, Austria, will boost the Agency’s ability to assist Member States in applying the Sterile Insect Technique (SIT) to combat insect pests that spread disease and damage crops. “With new and modern facilities, the IPCL will in future be able to do even more to help Member States control insect pests that endanger our crops, our livestock and our health,” IAEA Director General Yukiya Amano said during the inauguration ceremony. 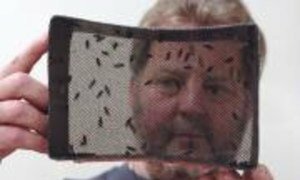 The environmentally-safe SIT, a form of insect birth control, uses radiation to sterilize male insects, which are reared in large numbers and released in a target area to mate with wild females. Since they do not produce any offspring, the pest population is reduced over time, according to the Agency. Along with additional space to train experts to support the transfer of SIT to countries, the new lab will facilitate research on the application of the technique for different insects, including mosquitos that transmit malaria, Zika and other diseases. “The IPCL offers a very tangible example of the enormous practical benefits of nuclear science and technology,” noted Mr. Amano. Earlier this year, the IAEA, in partnership with the UN Food and Agriculture Organization (FAO), assisted the Dominican Republic in using SIT to eradicate an outbreak of the Mediterranean fruit fly – one of the most damaging agricultural pests in the world that attacks several types of fruits and vegetables. Thanks to this assistance, the country was able to eradicate the fly within two years, and to regain access to export markets worth $42 million a year. The United Nations nuclear energy agency has begun constructing a new laboratory that will enable it to better help countries use nuclear techniques, such as application of irradiation to sterilize insects, in the fight against pests, including mosquitoes that spread the Zika virus and other diseases.